The wine is a blend of 90% Chardonnay and 10% Pinot Nero grapes and following fermentation it is aged on the lees for at least 18 months before disgorging. The complex, pervasive nose of sweet flowers and patisserie is accompanied by a dynamic yet soft fruity palate, a generous mousse and a very fine bead. 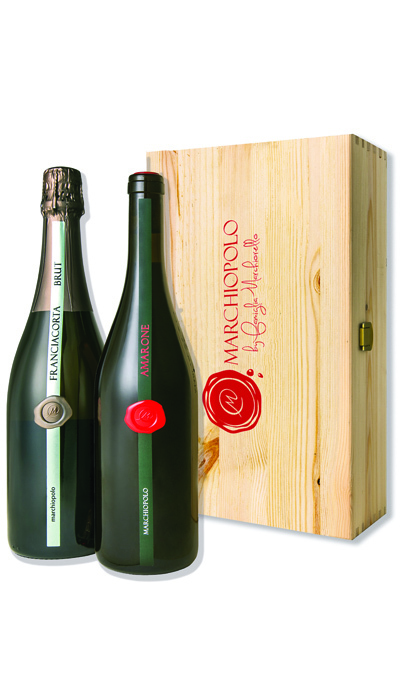 This Amarone is a blend of Corvina (80%), Corvinone e Rondinella grapes. The wine is aged in oak casks for 36 months and subsequently in the bottle, to achieve highly evolved notes, ranging from fruit to sweet spice, pepper and tobacco. The long, complex palate is soft and nicely balanced.